Nanocapsules is new branch of pharmacology which deals with various applications of nanomedicine. Nanocapsules are drug delivery agents within the size range of 10nm to 1000 nm that are normally composed of a capsule shell and a hollow space in which desired substance or drug molecules are embedded. Globally, Development of efficient and advance technology and growing demand of end user industry, investments and breakthroughs in biomedical, pharmaceutical, electronics, molecular and diagnostic fields are the prime growth drivers of global Nanocapsules market. In addition, increase in adoption of Nanocapsules for high disease burden of tuberculosis and cancer, and emerging economies such as China, India and others, will create new opportunities for global Nanocapsules market. However, higher cost of the research and development, complex manufacturing process, and higher cost of nanocapsules are the key restraints for global Nanocapsules market. Geographically Asia Pacific dominated global Nanocapsules market, with approximately half of the world’s procedures being done in the China and India. because of high medical reimbursement facilities, and technological advancement in cosmetics industry. 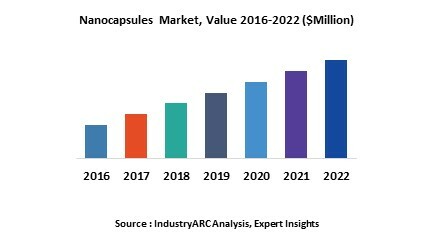 North America and Europe are also expected to boost demand for nanocapsules owing to the growing demand from the end-user industries for various applications. Among all the applications, drug delivery segment have the highest market share in global Nanocapsules market. This report identifies the global Nanocapsules market size in for the year 2014-2016, and forecast of the same for year 2021. It also highlights the market drivers, restraints, growth indicators, challenges, and other key aspects with respect to global Nanocapsules market.